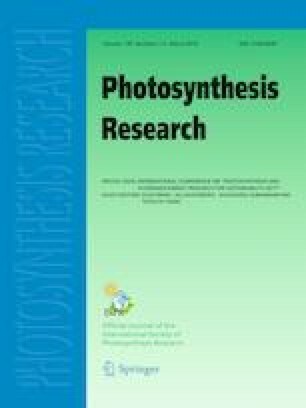 The phototrophic cyanobacterium Halomicronema hongdechloris shows far-red light-induced accumulation of chlorophyll (Chl) f, but the involvement of the pigment in photosynthetic energy harvesting by photosystem (PS) II is controversially discussed. While H. hongdechloris contains negligible amounts of Chl f in white-light culture conditions, the ratio of Chl f to Chl a is reversibly changed up to 1:8 under illumination with far-red light (720–730 nm). We performed UV–Vis absorption spectroscopy, time-integrated and time-resolved fluorescence spectroscopy for the calculation of decay-associated spectra (DAS) to determine excitation energy transfer (EET) processes between photosynthetic pigments in intact H. hongdechloris filaments. In cells grown under white light, highly efficient EET occurs from phycobilisomes (PBSs) to Chl a with an apparent time constant of about 100 ps. Charge separation occurs with a typical apparent time constant of 200–300 ps from Chl a. After 3–4 days of growth under far-red light, robust Chl f content was observed in H. hongdechloris and EET from PBSs reached Chl f efficiently within 200 ps. It is proposed based on mathematical modeling by rate equation systems for EET between the PBSs and PSII and subsequent electron transfer (ET) that charge separation occurs from Chl a and excitation energy is funneled from Chl f to Chl a via an energetically uphill EET driven by entropy, which is effective because the number of Chl a molecules coupled to Chl f is at least eight- to tenfold larger than the corresponding number of Chl f molecules. The long lifetime of Chl f molecules in contact to a tenfold larger pool of Chl a molecules allows Chl f to act as an intermediate energy storage level, from which the Gibbs free energy difference between Chl f and Chl a can be overcome by taking advantage from the favorable ratio of degeneracy coefficients, which formally represents a significant entropy gain in the Eyring formulation of the Arrhenius law. Direct evidence for energetically uphill EET and charge separation in PSII upon excitation of Chl f via anti-Stokes fluorescence in far-red light-adapted H. hongdechloris cells was obtained: Excitation by 720 nm laser light resulted in robust Chl a fluorescence at 680 nm that was distinctly temperature-dependent and, notably, increased upon DCMU (3-(3,4-dichlorophenyl)-1,1-dimethylurea) treatment in far-red light-adapted cells. Thus, rather than serving as an excitation energy trap, Chl f in far-red light-adapted H. hongdechloris cells is directly contributing to oxygenic photosynthesis at PSII. The online version of this article ( https://doi.org/10.1007/s11120-018-0556-2) contains supplementary material, which is available to authorized users. The authors thank Monika Weß and Sabine Kussin for technical assistance. Work was supported by the German Ministry of Education and Research (WTZ-RUS Grant 01DJ15007 to F.-J.S. and T.F. ; and Hochschulpakt Lehre III/ TU-WIMIplus program to F.-J.S. ), the German Research Foundation (Cluster of Excellence “Unifying Concepts in Catalysis”), and the Russian Foundation for Basic Research (Grant No. 18-04-00554 А to E.G.M.). S.I.A. was supported by a grant from the Russian Science Foundation (Grant No. 14-14-00039). M.C. acknowledges the research supports by the Australian Research Council Centre of Excellence for Translational Photosynthesis (CE140100015). This study was supported by Grants-in-Aids for Scientific Research from JSPS (Nos. 26220801, 17K07453, 18H05177 to T.T.) and a grant from JST PRESTO (T.T. ).